The Indian Council for Mental Health (ICMH) is an organisation with a long history of working in mental health since 1953. Over the years, ICMH has narrowed its focus to children with developmental disabilities, and currently works with 275 children through its two centres. What is unique about the ICMH program is that it provides multiple therapies under one roof, including progressive ones such as animal therapy and art therapy. The therapies are provided free of cost, to encourage regular participation of the needy students. School fees are charged at less than 50% of the normal market rate for special needs schools. In the recent past, ICMH has also worked on building its internal capacity, by adopting a more professional approach to operations, through measures such as periodical appraisals, individual goal setting, monthly review meetings, etc. ICMH has received an ISO 9001:2008 certification as a result of these measures. Going ahead, ICMH plans to continue its motto of providing free-of-cost quality therapy to as many mentally challenged children as possible. The organisation looks forward to extending its school building at Nerul and acquiring a school property at Mulund in the near future. Total Income: The total income raised by ICMH in FY13 amounted to Rs10.6mn, which was around 5% higher than the income of FY12. The largest source of income was through school tuition and fees for the computer and vocational programs, which formed almost 45% of total income (Rs4.7mn). Rehabilitative therapies are provided free of cost. The second highest source of funding was from institutional donors which amounted to Rs3.5mn (33%). This is about 31% higher than the average of the previous three years. Income from corporate sources formed a little over 12% of the total income (Rs1.3mn), falling by almost 15% from the previous three years’ average. The largest decrease was witnessed in the case of individual donors, which formed approximately 6% of the total income, and fell by around 77% from that of the previous year FY12. The deficit of FY13 amounted to Rs0.9mn, which is approximately the average deficit of the previous three years as well. 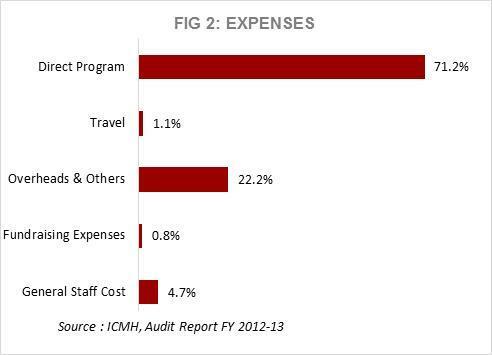 Spend on Programs vs. Overheads: In FY13, ICMH allocated around 71% (Rs8.2mn) of its expenditure towards direct program activities. A large part of these program expenses (95%) pertain to the salaries paid to the teachers and therapists who work with the students. Overheads, professional fees and other expenses formed 22.2% (Rs2.5mn) of the total expenditure, and comprised mainly depreciation (9%), security charges, repairs/maintenance, electricity and ISO maintenance charges. Comparing with other NGOs working in the disability space, the average spend towards overheads is around 24% on an average, with 5% out of this being on account of depreciation. We can compare in particular with Prabhat Educational Foundation (Ahmedabad) and Ajinkya Foundation (Sangli), both of which work with mentally challenged children. While Prabhat spends 30% on overheads (no depreciation), Ajinkya spends 18% on overheads and additionally 9% on depreciation, as it is currently building a rehabilitative centre. Thus, ICMH falls reasonably within the sector range for expenditure on overheads. Cost Per Beneficiary: The cost per beneficiary in the case of ICMH comes to Rs47,739, and has been in the range of Rs39000-49,000 since FY10. By comparison, the cost per beneficiary (FY13) in the case of the earlier mentioned NGOs, Prabhat Educational Foundation and Ajinkya Foundation is Rs20,000 and Rs28,361 respectively. Fixed Assets: Fixed assets held by ICMH at the close of FY13 amounted to Rs9.9mn, of which Rs7.4mn (75%) is attributable to immovable assets in the nature of land and building for the school at Nerul. Investments and Bank Balance: Investments as on the FY13 year-end stood at Rs4.5mn and were in the form of bank fixed deposits. Interest on investments during FY13 amounted to Rs0.4mn and formed around 4% of total income. The savings bank balances amounted to around Rs3.1mn. ICMH did hold any cash in hand as of 31 March 2013. Corpus Fund: The corpus fund at the end of FY13 amounted to Rs14.5mn, increasing only marginally from the previous year. For a perspective on sufficiency, this amount is around 127% of the total expenditure incurred in FY13. ICMH additionally has general funds of around Rs2.9mn, after setting off the Y-o-Y deficits. Earmarked funds, i.e. funds donated towards specific purposes only, amounted to Rs0.9mn as on the same date. Income Growth Rate (IGR): The IGR of ICMH wavers greatly from year to year. Income grew by 69% in FY11, but fell by 19% in FY12. FY13 saw a recovery to 5% growth in income, but this is still on the lower side, given the continuous deficits ICMH experiences. A focus on raising annual income is a priority at this point. Self Sufficiency Ratio (SSR): The SSR measures an organization’s ability to raise funds from steady sources of income such as individuals, investment income, beneficiary fees, etc. 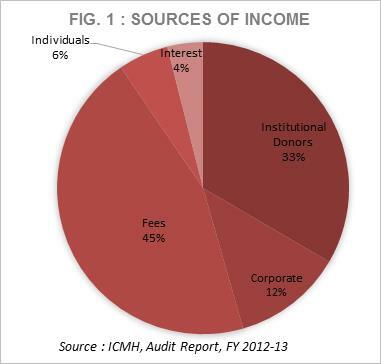 Given that the largest portion of ICMH’s funds come from school fees, the SSR in FY13 amounted to 55%. However, this is still a drop from the SSR of FY12 (74%), resulting from the decrease in donations from individuals. Fundraising: Fundraising remains the main challenge for ICMH, as it has not been able to generate a surplus in a number of years, and the annual deficits are eating into the accumulated reserves of the organisation. The challenge with the funding gap is that it keeps widening with each year, owing to inflation of expenses and revision in salary scales of the teachers. However, the fee scales cannot be proportionately increased, to avoid financial pressure on the families of the students. ICMH currently lacks staff for communications and fundraising, and as the gap increases, the burden on the existing personnel keeps increasing tremendously. Staff Attrition: ICMH faces challenges in retaining its teaching staff, as most of them are drawn to jobs in municipal schools, which offer not only a higher salary but more job security. Website and Media: Owing to the lack of staff (or financial bandwidth to hire) for communications roles, the website and social media channels of ICMH tend to be neglected and outdated. This again hampers the organisation’s ability to stay connected with the larger public for the purpose of creating awareness and raising funds. Lack of Advocacy: ICMH has so far not been able to make notable progress in advocating the cause. The management feels that much more can be done in terms of sensitizing the public to the needs of the mentally challenged. But the lack of staff to actively take up this role is what has left this aspect unattended to. The Board of ICMH consists of a mix of individuals from varied professional backgrounds. The Board is chaired by Mr. TNV Ayyar, who is a Chartered Accountant by profession. Vice-President and Managing Trustee is Mr. Zarir Master is also a practising management consultant. Ms. Madhubala Kajle, Secretary is Senior Counsel to the Government of India, while Dr. Abdul-Karim M. Naik is a psychiatrist. The rest of the Board is formed by those with extensive experience in the fields of education and social work. ICMH was one of the first organisations to be accredited by the Credibility Alliance. ICMH also has ISO 9001:2008 certification, and is registered with Give India.